Don’t sacrifice valuable desk space for great sound. The inclined design of Z213 directs sound right to your ears. Feel full bass. 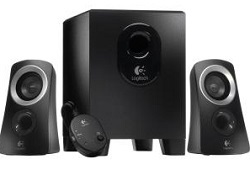 A down-facing subwoofer with a 4” driver provides a rich bass experience with these 2.1 speakers. Turn up the bass to your acoustic needs with a separate control knob at the back of the subwoofer.